If you feel like you are running nowhere in every direction, this class will give you permission to stop and take one seat. 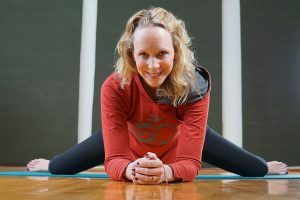 This hatha yoga class allows you to take one seat and create the compassionate space that allows for the arising of all things, the sorrows, loneliness, shame, desire, regret, frustration, and happiness as Jack Kornfield would say. In our culture there is a tendency to move from one thing to the next when we get uncomfortable. If we are bored or anxious we scroll through social media. 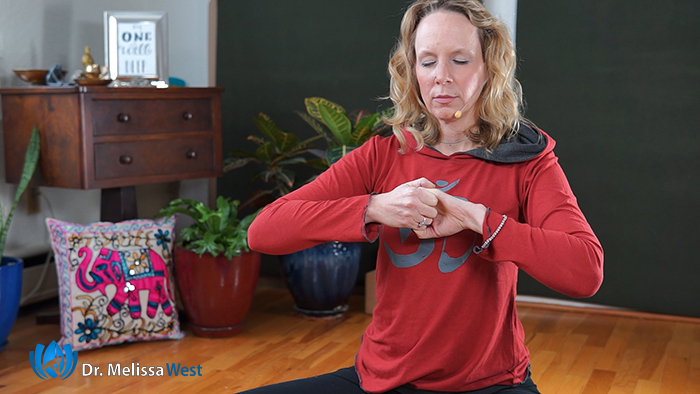 In this hatha yoga class we will practice staying, grounding and gently opening our hearts. The hatha yoga class begins with a supported, restorative yoga pose, reclined bound angle pose to gently open your heart and hips. From there we will open your hips with frog pse and lunge pose. When we come to standing we will gather the courage to stay with Goddess Victory Squat. In a gentle backbend we create a compassionate space to be with whatever arises. 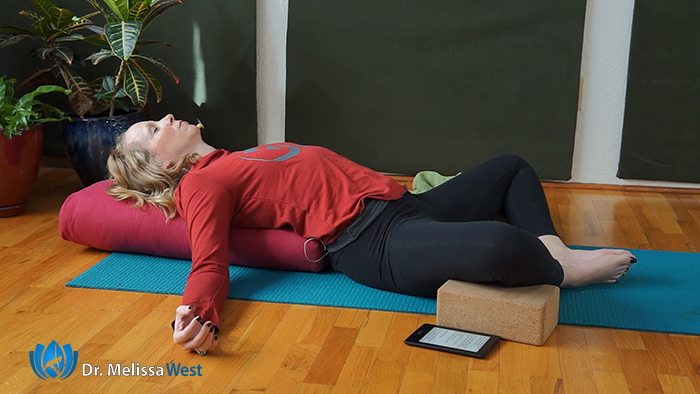 Reclined twist and happy baby pose allows a release through your spine and hips. We will finish this hatha yoga class with a Mary Oliver poem in savasana and the Ganesh mudra for courage. I am grateful for the teachings from Jack Kornfield’s A Path with Heart as they have been guiding my own teachings at this time. Did it feel good to stop running nowhere today and take one seat? If so give this video a thumbs up. If you know anybody else who would like to stop running nowhere and take one seat then feel free to share it with them. Thank you so much for your donations: Sean, Anne Marie, they help us to continually improve our show for you. One of our most recent improvements was a new lense which makes everything both buttery soft and sharp at the same time. Both Tim and I are in love with this lens so thank you. You can donate of your time by leaving your comment below. What is your one seat that you take when you notice yourself running around nowhere? At the beginning of the class I told you I keep the teachings here as brief as possible because of the feedback I have received from my online classes my intention is to keep these classes as minimalist as possible at these time. So I’m going to be honest with you here and ask you, Are you caught up in sampling? If you do a little of one kind of practice and a little of another, the practice you have done in one will not continue to build as you change to the next. Sampling will keep you unhappy and caught up in the same old struggles. If your years of practice haven’t changed anything and your practice hasn’t progressed, then now is the time to ask, am I sampling, running from one thing to the next? Do you have a committed relationship of trust with your teacher and one specific form of practice? Or are you running all over the place from one kind of spiritual practice to another? Until you choose one discipline and commit to it, a deeper understanding of yourself and the world will elude you. Do you want to go deeper with these teachings? If there is a resonance or charge for you in your body right now? Are you are feeling called? If so, I hold space for a small group of students within our membership community to go deep with the full teachings on taking one seat and I will be giving the rest of these teachings in my weekly teaching talk in our Live Classes in our Membership Community at 9:30 am and 5:30 pm PT on Mondays followed by a guided relaxation and time for group discussion. Yoga Postures/Asanas: Reclined Bound Angle, Frog Pose, Lunge Pose or Anjaneyasana, Goddess Victory Squat or Utkata Konasana, Wide Legged Standing Forward Fold or Prasarita Padottanasana, Sphinx Pose or Salamba Bhujangasana, Reclined Twist or Jathara parivartanasana, Happy Baby Pose, Savasana or Corpse Pose, Ganesh Mudra for Courage. If you are not a member, you can become a member by clicking this link below.